Since the creation of blockchain technology, there have been numerous attempts at applying it in a multitude of different industries. Some succeeded, other failed. One thing has remained clear over the years – the true potential of blockchain is cryptocurrency and its inevitable disruption of traditional currency. The first step on the way to complete adoption is through e-commerce, but no company has been able to overtake that industry to date. The UK based development team behind ARAW has realized that it isn’t enough to just introduce blockchain to the e-commerce sphere, more incentives are required to attract the general public. ARAW ecosystem has arisen as a result of the team’s work on improving every aspect of online payments, and making cryptocurrency transactions as convenient and accessible as possible. ARAW , at its core, is a decentralized payment ecosystem, but it also has a number of innovative functions, not found anywhere else. We will look into the Unified Reward System and ARAW Touch and Pay card in more detail, as in my opinion they are the main attraction, but features like peer-to-peer transfer, ARAW mobile wallet and integrated cryptocurrency exchange are also worth mentioning. The end-goal of the ARAW token is to become everyone’s routine payment method for online and brick and mortar store purchases, eliminate the reluctance that people have towards cryptocurrency. The token has been built using ERC20 standards to ensure utmost security and transparency of the payments. Traditionally loyalty systems are owned by a specific retailer and thus have very limited value to the customer. The Unified Reward System will connect all merchants on the platform and provide the ARAW token as a means to reward their clients. This way different brands and services can interact and benefit from each other, while creating a favorable environment for their customers. ARAW Touch and Pay card is very similar to already existing card technology, but instead of fiat, it holds ARAW tokens earned by users of the platform by participating in promotions. Using cryptocurrency has never been as easy and seamless as with ARAW. These features are sure to drive clients, vendors and investors to the platform. Furthermore, the banking integration, Open API, cryptocurrency exchange, the mobile wallet and separate business and customer applications will make sure that they have everything to never come back to the old-age methods. 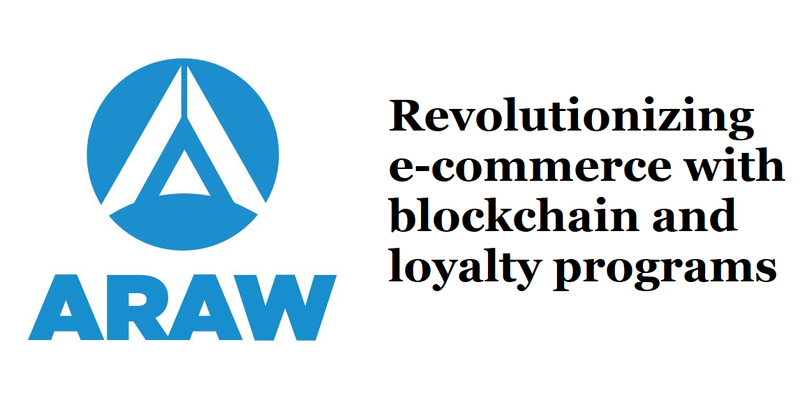 By joining the ARAW platform, merchants gain the benefits of the blockchain technology, significantly increase the acquisition of new clients, have a space to create custom promotions and save time and money they would’ve lost using traditional e-commerce. By engaging with the companies listed on ARAW, users receive reward tokens that can be exchanged for fiat currency, or redeemed with other companies for their services. All-in-all, it is only a matter of time before blockchain overtakes the e-commerce industry. Thanks to the rich experience of the ARAW development team and unique ideas enclosed in the platform, ARAW is poised to become one of the leaders in e-commerce. Please check out the links below for more information about ARAW ecosystem, their tokensale and technical details behind the project. Are you satisfied with your experience of online shopping? Have you used cryptocurrency in day-to-day purchases? Please tell me in the comments below.